The following report is from the Saturday 23 August 1947 issue of the Western Gazette. A fire which at one time threatened to spread through Yeovil's main shopping centre broke out in the rear of Messrs Timothy White's and Taylor's shop in Middle Street early on Thursday morning. Forty firemen from Yeovil and Martock NFS Brigades - some of them wearing breathing apparatus and asbestos suits - fought the blaze in dense smoke and choking fumes for two hours before getting the upper hand. The cause of the fire is not known. Tongues of flame twenty feet high lit up the centre of the town, and silhouetted fireman on the rooftop. Suffocating smoke drove families in adjoining flats from their beds into the streets. Some prepared to evacuate their homes. Tradesmen also packed up their goods in readiness. Mr Harwood, Manager of Messrs John Farmer's boot and shoe shop next door to the chemists, his wife, and son, Mr Douglas Harwood, were helped by a "chain" of neighbours to move their most valuable and essential belongings to safety. The wall between their shop and Timothy White's got so hot that hoses had to be played on it. Foodstuffs from Messrs Lipton's stores on the other side, at the entrance to Frederick Place, were carried over to the George Hotel. The firefighters worked under exceptional difficulties, and many were the tributes paid to them and to their leaders, Sub-area Commander Column Officer CO Mitchell of Yeovil, and Company Officer Ewart Hebditch, of Martock, for their swift and efficient action which undoubtedly checked a dangerous situation. Middle Street, Vicarage Street and Frederick Place were laced with hoses, use was made of a static water tank in Vicarage Street. Fireman worked ankle-deep and sometimes nearly knée-deep in cascading water. Some of them were temporarily affected by chemical fumes and smoke. There were minor explosions as highly inflammable materials and chemical substances caught alight. A paraffin store added fuel to the flames which ate their way steadily towards the shop overlooking Middle Street. The premises were gutted, but a strange feature was that the front windows, with the goods in them, looked untouched from the road. When the street was specially illuminated to help the fireman dozens of articles were seen floating out of the shop and down the highway. Hoses were run up to the roof in order to play more jets on to the seat of the fire. Then to the firefighters aid, at about 1:30am, came torrents of rain, the first real storm the town has experienced for some weeks. Another coincidence was that as the alarm was given at midnight the clock of the Parish Church struck 13! First warning of the fire came from 15-year-old John Hawkins, who lives with his grandfather at 18a Middle Street, Yeovil, which is a few doors away. As he was going to bed the lad saw the glow of the fire, and immediately called his grandfather Mr T Smith, that "Timothy White's was on fire." Mr Smith, accompanied by his nephew, Mr Tom Haggerty on holiday from South Wales, stopped a passing car in Middle Street and went to the fire station. "Within two minutes," Mr Smith said, "the fireman were here." The branch manager, Mr DT Evans, of Sparrow Road, said he had no idea how the fire started. "We are always very careful indeed in our stores at the back of the shop," he said "and, in fact, everywhere on the premises, so I do not think it could have been a cigarette end which caused it." He added that the shop's 13 employees should not be affected as the company has another shop higher up Middle Street". Mr R Adams, Hardware Manager, who was also called from his bed, was on holiday. In an interview, Column Officer Mitchell said the firemen put in two hours of grueling fire fighting before the fire was under control. Every man was on the run and they acquitted themselves remarkably well. He added a special word of praise for the many former members of the NFS who helped during the night and "did the right thing at the right moment." During the night Fire Force Commander JY Kirkup travelled down from Bristol. Because of the intense heat, which even melted and rolled-up some thick glass in the store, the firemen were unable to effectively fight the fire from the ground level, and hoses were run through the premises of Messrs Lipton's and Messrs Hepworth's so that water could be played onto the flames from adjoining rooftops and iron staircases. The fire escape was also brought into use and a jet directed onto the burning shop from there. In all 12 jets of water were in use, and by utilising the Vicarage Street static water tank, the Fire Service was able to conserve the town's water supply to a large extent. Mr Stanley Elliott of 16 Middle Street, whose jeweller's business backs on to the premises of Messrs Timothy White's decided to evacuate when he felt the heat from the fire coming through the walls of his house. He first escorted his 84year old mother to a place of safety and returned to aid the firemen. Eighty-six-year old Mrs Sarah Cunningham, who lives with Mrs Mabel Horrill in Frederick Place, slept through it all. "We didn't like to wake her as we thought she might be upset." said Mrs Horrill who, with most of her neighbours, moved temporarily across the road and stayed with friends. Many thanks to Rob Baker for forwarding this article to me. 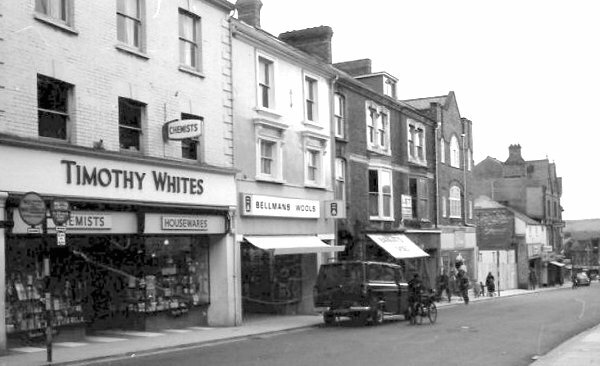 Less than twenty years after the fire, this view of Timothy White's in Middle Street dates to the 1960s - the entrance to Frederick Place is immediately behind the van at centre. Bellman's wool shop was, at the time of the fire, Lipton's grocery (mentioned in the article).